Research in autonomy focuses on the description, design, and decision-making in systems involving interactions between human and machine, robotics, and automation. 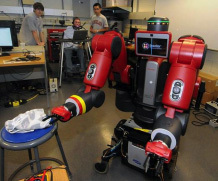 Applications range from collaborative human-robot systems, autonomous systems under human supervisory command, synthetic human/autonomous-agent environment such as multi-player games, and assistive systems for elderly and handicapped individuals. Synthetic Environment, such as emersive multi-player games with virtual or augmented reality, may be used to simulate such systems for training, algorithm development, design, and optimization. Variable Autonomy addresses the variable partition of authority between human and automation. Efficiency / Robustness / Safety are issues that characterize the behavior and performance of human-automation systems. Ethics for autonomous systems will need to carefully considered in the system design to ensure consistency with designer's value.